Implementing cloud-based secure email archiving software can have tangible benefits for businesses operating within a regulated industry, handling a large volume of email correspondence, storing business-critical data on its mail server, or maintaining the personally identifiable information of EU citizens on email. If your business operates in a regulated industry, retains emails for eDiscovery purposes, or has access to personally identifiable information belonging to EU residents, secure email archiving software can help your business comply with legislation such as HIPAA, SOX, and the Federal Rules of Civil Disclosure, and the EU´s General Data Protection Regulation (GDPR). Other benefits of software for securely archiving email include reducing the workload on your mail server, reducing the workload of your IT department, and reducing the likelihood of an employee stealing business-critical data or maliciously deleting it when they leave. Furthermore, accidental deletions can be quickly restored without any loss of data. Whatever your business´s motive for archiving emails, cloud-based solutions undoubtedly have better usability than on-premises solutions or those that archive data by retaining it on removable media. Email data is stored in a single easy-to-access server (provided the user has the correct access credentials) that frees up space on on-premises servers and eliminates the need to restore multiple emails from multiple devices in order to search for specific information. Data stored on cloud-based secure email archiving software is equally as secure as data stored on-premises or off-premises, plus the risk of physical media being stolen or damaged is eliminated. Being cloud-based software, data can be searched faster and retrieved/restored faster. This makes a cloud-based solution much more appropriate for businesses archiving data for compliance purposes, keeping an email archive for disaster recovery purposes, or protecting data from insider theft. Cloud-based software for secure email archiving copies emails in real time as they pass through the mail server. Duplicated content and attachments are removed before each email is indexed, compressed, and encrypted prior to being transferred securely to the remote server. Once archived, authorized users can search for emails within their permission levels, and print, export or restore the emails with the click of a mouse – with all their activity being monitored and recorded on tamper-evident audit trails. Users´ permission levels are determined by administrator prescribed access controls, and – where allowed – users can search by individual user, user-group, department, or business-wide. Frequent searches can be saved and automated, with results produced according to a schedule or on demand. Keyword-reliant retention policies can be applied to the database of emails to prevent accidental deletion, and alterations to email data can be reversed when necessary. The features and benefits mentioned above (security, speed, encryption, indexing, audit trails, etc.) help businesses that maintain the personally identifiable information of EU citizens on email comply with the General Data Protection Regulation (GDPR). Compliance with GDPR is essential for all businesses that create, process, or store EU citizens´ data regardless of the business´s location around the world. Similarly they help businesses comply with the requirements of the California Consumer Privacy Act. Going back to GDPR, having a fast indexing and retrieval process is particularly important in order to resolve data access and erasure requests by EU citizens. Searches can be completed and access requests answered well within the thirty days allowed by GDPR – after which businesses could be subject to substantial fines for non-compliance, even when no data breach has occurred. Businesses may find it hard to comply with data access requests within thirty days is still using removable media to store data. The further benefits of secure email archiving software have been touched upon briefly, but a further explanation could be useful – for example, reducing the burden on the IT department. In 2016, a survey sponsored by Abode found that 57 percent of employees spent one hour each day searching for misfiled or accidently deleted documents and emails – often calling for assistance from IT personnel and reducing the productivity of two employees rather than one. With the search feature on secure email archiving software, users can search for and retrieve emails in their permission level within minutes. Similarly emails pertaining to client complaints or HR issues can be located and restored within minutes with interrupting the flow of inbound and outbound mail through the mail server. Ultimately, secure email archiving software saves businesses time and reduced the risk of a data breach – thus saving businesses money in more ways than one. ArcTitan from WebTitan is easy-to-administer cloud-based software for secure email archiving built for speed. Our software can archive up to two hundred emails per second in real time and search a database of thirty million emails in less than a second – even if it has been scaled to its maximum capacity of sixty thousand simultaneous users. 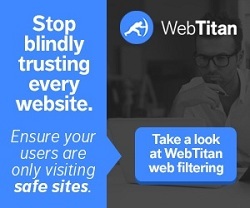 Needless to say coming from WebTitan, ArcTitan has also been built for easy management. ArcTitan integrates with directory services such as LDAP, Active Directory, iMail, and Google so that access controls can be applied within minutes. ArcTitan is compatible with all operating systems and all leading email services, and no data conversions from exiting archives are required before our software is ready to use. ArcTitan assimilates existing PST files into a single, searchable archive that can be accessed by authorized users from any Internet-enabled device. To find out more about ArcTitan, or to request a free trial of our secure email archiving software, do not hesitate to get in touch. Our team of Sales Technicians will be happy to answer any questions you have and can arrange for a no-obligation demonstration; or guide you through the registration process to try ArcTitan for free and evaluate it in your own environment.